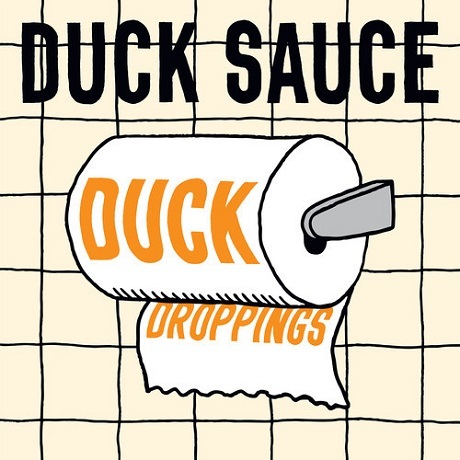 A-Trak and Armand Van Helden have once again teamed up as Duck Sauce to deliver a quick collection of freebies to their faithful. In fitting with that mallard-minded moniker, the four-song gift has been given the quite colourfully messy title of Duck Droppings. The quick collection has a throwback feel, whether via the glimmering disco-ball melodies of "Party in Me" or "Louie the First," whose sample of the Hot Chocolate's "Brother Louie" may be familiar to many as the theme song to Louis CK's Louie. Elsewhere, "Calamari (Put the Sauce On It)" throws jovial guitar and four-on-the-floor house rhythms into the mix, while French Touch is explored with flanged-out phasers on "Mondo." You can pick up Duck Droppings down below, and peep its potentially Descendents-inspired album art up above.